The Professional Sound Corporation® Press Bridge has been designed to allow easy and convenient audio distribution at press conferences. This Press Bridge features two inputs each with a very low noise microphone pre-amplifier for use with dynamic microphones. In addition there is one line level input for use in sending house program audio or other line level feeds. Each of the three dedicated inputs has an independent level control, thus the Press Bridge may operate without the use of any additional audio mixer. There are two types of outputs available directly on the Press Bridge. There are 12 transformer isolated, balanced microphone level feeds that can be used to send isolated audio to the various news crews attending the press conference. There are also 3 balanced, line level feeds that are used to feed one or more PSC Press Trains. Each of these three outputs is designed to feed up to eight (8) PSXC Press Trains in a daisy chain configuration. An important distinguishing feature of this Press Bridge is the ability to add additional "satellite style" output modules each with 12 additional outputs, all the way up to a total of 300 outputs. These freestanding output modules are available as the PSC Press Train. Up to 24 Press Train modules may be remotely located from the main unit via standard microphone cables up to 500' in length thus eliminating multiple long cable runs to each member of the media. Simply run a standard XLR microphone cable from the Press Bridge to one or more Press Trains laid out in a daisy chain. It is easy to place a Press train box every 10 feet (3M) on the floor to create a very large audio distribution system for up to 300 press crews. 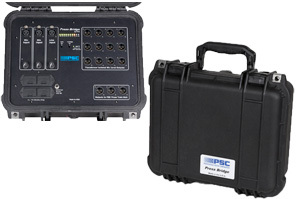 The Professional Sound Corporation ® Press Bridge is housed in a waterproof Pelican™ 1400 case for ease of use and shipment. It can be powered for more than 8 hours from four 9 volt batteries, or it may be powered from a 12Vdc adapter. A built in peak reading LED bar-graph meter and an internal reference tone oscillator are provided for level setting purposes. A two-color power indicating LED serves to let the user know battery condition.